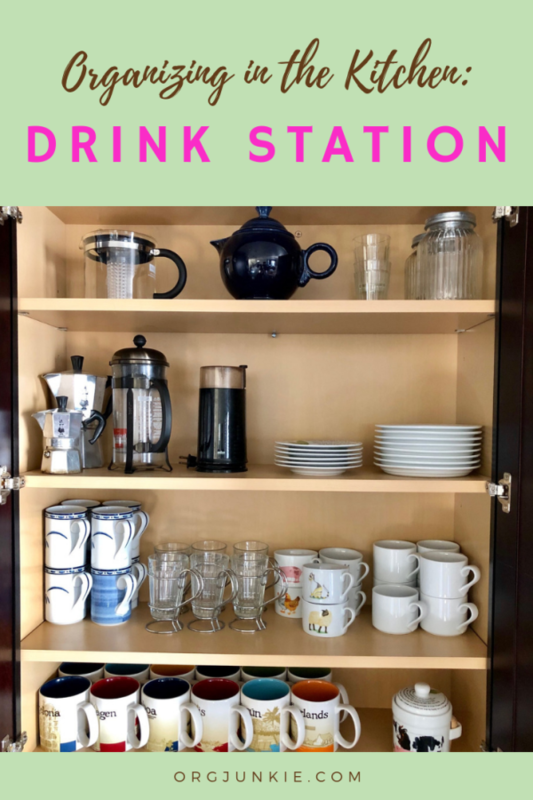 The following is a guest post about how to organize a kitchen drink station from regular contributor, Morgan from Morganize with Me. In our current season, raising three teens, our front door and garage door both feel like revolving doors. We often have kids (or young adults) lined up at our kitchen island chatting, eating, and drinking. I love hosting and welcoming these amazing kids into our home and I’m savoring this season. 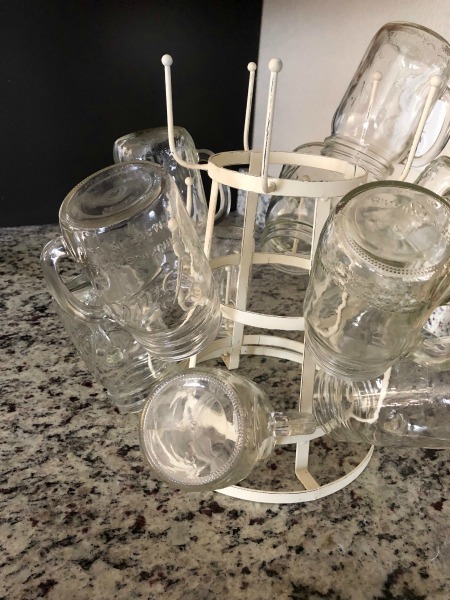 One of my mom hacks (or survival tips) is to create an organized drink station so that anyone can help themselves to a beverage. We have one set up for business 24/7. By creating a “zone” for all things drink related it’s easy for our guests to self-serve and easy for us to host and entertain. In our drink station, we have different zones within the station. 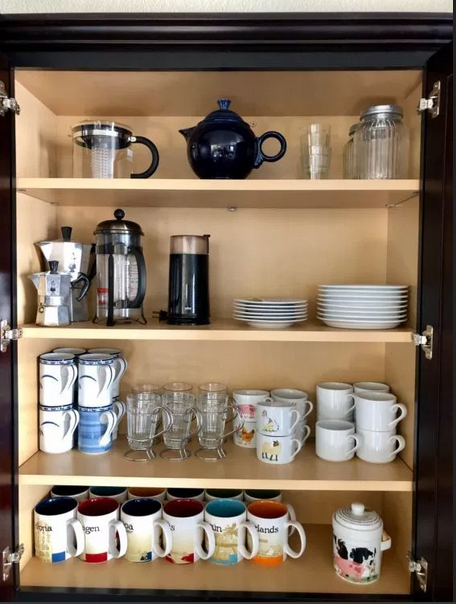 This cupboard holds all of our mugs and coffee cups, saucers and coffee and teapots. It’s a one stop shop for all things drink related. We took advantage of our time living overseas to collect Starbucks coffee mugs from the different places we visited. *Organizing Tip: if you want to collect things, try to find something that you can use often so you can also add some practicality to your home. 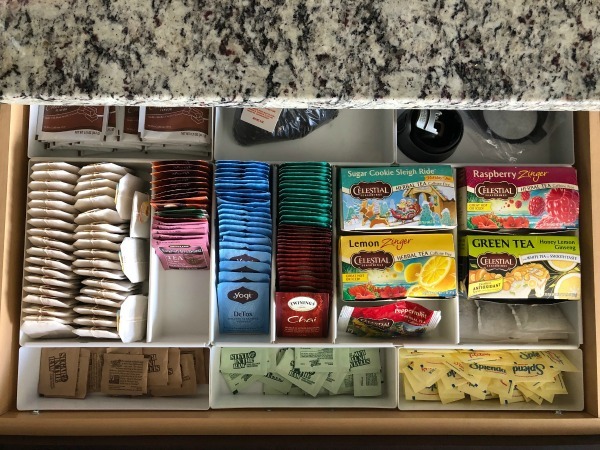 In this drawer, I organized a spot to hold sugar packets, iced tea bags, hot chocolate mixes, teas, and coffee pot accessories. Using these Rubbermaid drawer dividers makes it easy for me to know when we’re low on inventory and also helps for wanting particular beverages to better know their choices. And yes, we do drink a lot of tea around here! Lastly, on the counter I have a holder for stirring spoons from Cost Plus World Market. 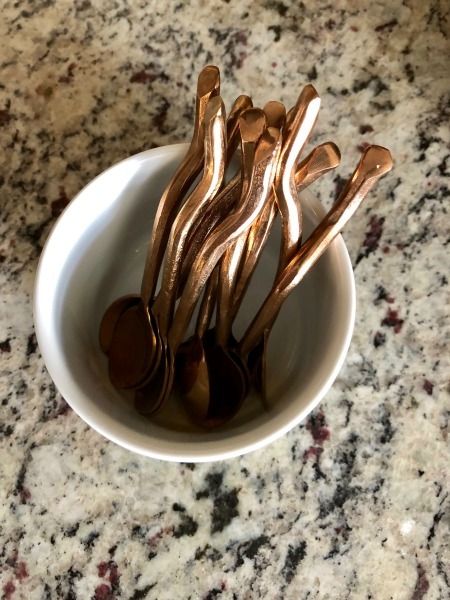 My mom always had this in our kitchens growing up and I love having a quick access to a stir spoon. How fun is this gold finish too? When it comes to hosting or serving, find ways to simplify and streamline. 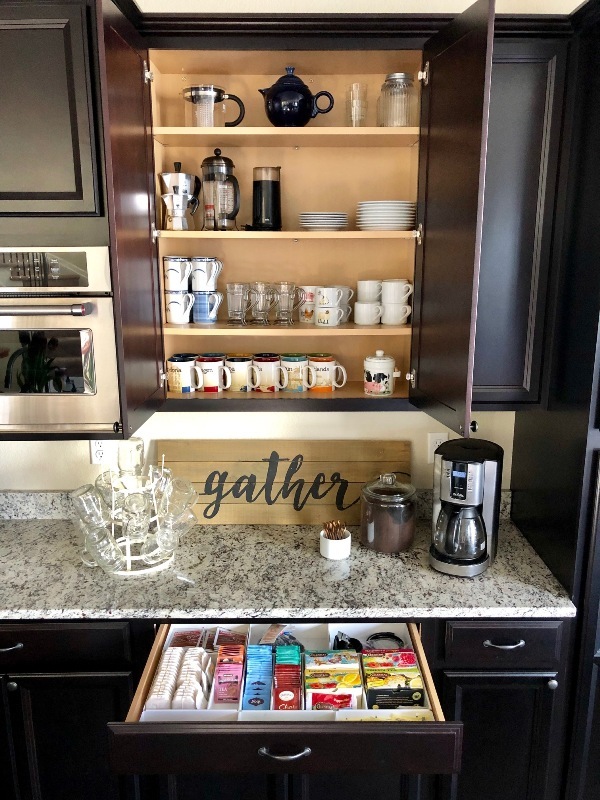 The more you can organize a zone that encourages your family and friends to grab a drink, the more they will feel at home while also making things easier for you when hosting. Additionally, try to keep extra beverages on hand. One of the best ways to help someone feel welcome, is to offer them something to drink. A few staple drink items in your pantry or refrigerator can make having others in your home that much easier for you. Organize a drink station if it makes sense for your home and lifestyle. I know my husband and I look forward to our early morning cups of coffee and our nightly cups of tea. It’s the little things. Although we are not looking forward to the days when all of these teenagers have flown the nest! Morgan is the energetic and motivated, but also realistic girl, behind Morganize with Me. She is a chaos calmer, list lover, and exercise enthusiast! Her mission is to share tried and true techniques that she hopes will encourage her readers and clients as they focus on their health and homes. Listen to her Podcast, join one of her Challenges, and check out her Shop full of fabulous organizing printables! I have something similar and love it.